A bibliographic update to Vol. 1, pp. 4–7. Main publication: H. Khalaily & O. Marder, The Neolithic Site of Abu Ghosh: The 1995 Excavations (IAA Reports 19), Jerusalem 2003. Studies: M. Lechevallier, ABD, 1, New York 1992, 46–47; O. Marder et al., Neo-Lithics 1996, 3–4; id., ESI 19 (1997), 70*–71*; id. 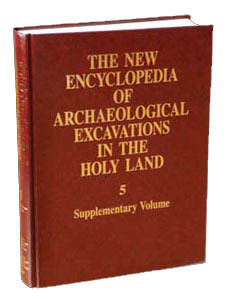 (& H. Khalaily), AJA 102 (1998), 763; E. B. Banning, NEA 61 (1998), 188–237; 66 (2003), 4–21; O. Bar-Yosef, Proceedings of the 4th International Symposium on the Archaeozoology of Southwestern Asia and Adjacent Areas (eds. M. Mashkour et al. ), Groningen 2000, 189; R. Barkai, Flint and Stone Axes as Cultural Markers: Socio Economic Changes as Reflected in Holocene Flint Tool Industries of the Southern Levant (Ph.D. diss. ), Tel Aviv 2000 (Eng. abstract); id., ibid. (Studies in Early Near Eastern Production, Subsistence, and Environment 11), Berlin 2005, 149–154; K. I. Wright, Proceedings of the Prehistoric Society 66 (2000), 105; S. Yamada, Development of the Neolithic: Lithic Use-Wear Analysis of Major Tool Types in the Southern Levant (Ph.D. diss. ), Cambridge, MA 2000; G. Kahila-Bar Gal et al., Ancient Biomolecules 4 (2002), 9–17.